July 1698. Sano Ichiro, the samurai detective who has risen to become the shogun's second-in-command, is investigating rumors of a plot to overthrow the ruling regime. When the investigation brings Sano's deputy Hirata to Lord Mori's estate, he is shocked to find Lord Mori murdered and grotesquely mutilated in his own bed, and Sano's pregnant wife, Reiko, lying beside him. The only solid clue is a chrysanthemum soaked in blood. <br />&nbsp;&nbsp;&nbsp;&nbsp;&nbsp;&nbsp;&nbsp;&nbsp;&nbsp;&nbsp;&nbsp; Reiko's account of her actions is anything but solid. She insists that she went undercover to Lord Mori's estate in order to investigate claims that he molested and murdered young boys. But when Sano inspects the crime scene, he finds no trace of what Reiko described. And every other witness tells a different story: Lady Mori alleges that Reiko was Lord Mori's scorned mistress and murdered him for revenge. And Lord Mori himself, speaking through a medium, claims his murder was part of Sano's plot to overthrow the shogun! <br />&nbsp;&nbsp;&nbsp;&nbsp;&nbsp;&nbsp;&nbsp;&nbsp;&nbsp;&nbsp;&nbsp; Unless Sano can prove his wife's unlikely claims, both he and Reiko--and their unborn child--face execution for treason. 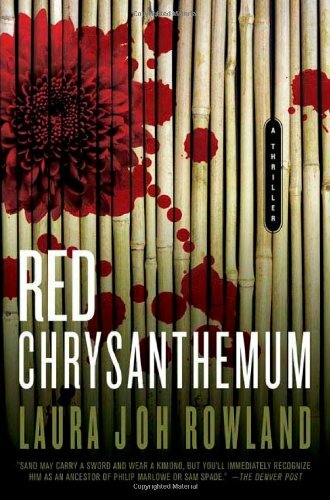 Sano fights desperately to save his family and his honor, as Laura Joh Rowland draws on the tradition of the classic film <i>Rashomon</i> to bring us a masterful tale of intrigue and treachery.